If you want to increase your rev rate, it is critical that you be patient in the swing and allow the hand to remain in a strong finger position prior to initiating the release. All too often bowlers begin to throw too soon or too late. Both, are ball reaction killers. Read more to learn how to keep your hand in a strong position to generate more revolutions. If you want to generate more revolutions at release, you must maintain a strong finger position until you initiate the release. More over, you must not begin to turn the hand too soon. Professional bowlers are able to generate a high rev rate (375 on average of higher) due their ability to put the hand in a strong position prior to beginning the release. You see this in the photos below. The fingers remain in a strong position much longer than the amateur bowler allowing the fingers an opportunity to rotate much further around the ball, at release. What I teach to bowlers is to wait until their hand is passing the heel to ignite their release. This is the point in which a bowler should begin to accelerate through to the release. This allows a bowler to have a specific reference point to ensure that they are not beginning the release too soon or too late. In fact, research on professional bowlers shows that the acceleration point for an elite bowlers begins just in front of the ankle and is a small acceleration window. 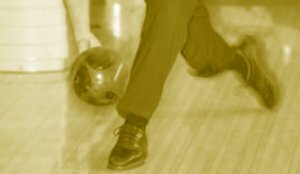 By targeting the heel in the mind, the bowler will process and really begin to throw the ball around the ankle. Some bowlers kill the potential ball reaction by beginning to throw the ball too early. You can see them starting to accelerate in the middle of the back, at the waist or at the knee. This will always reduce ball reaction. They rotate the ball too soon and lose ball reaction, ball speed and rev rate. On the flip side, are those bowlers who throw the ball too late. You will see these bowlers often have a reduced ball reaction as well. To begin the process, in the stance, place your ring finger at 7 o'clock (RH) or 5 o'clock (LH). Be sure to use your balance hand to support the weight of the bowling ball. Try to maintain this position through the entire push-swing sequence. This will allow you to put your hand in a strong position prior to the release start. Wait until your heel to begin the release. This will take some practice if you are throwing too soon or too late. As you imagine your hand passing the heel, begin to accelerate through to the release point. Basically, you are using the heel as a mental reference to build a habit of throwing at the best possible point on the swing. Be patient, it will take time to master this. Consciously think about the heel as a reference when practicing. IMPORTANT NOTE: Don't think about the heel when you are trying to score. Research has shown that when an athlete thinks about mechanics, in competition, they underperform. But, if you see little ball reaction or feel your self throwing too early, then use the heel reference on a few shots to secure your release timing and feel back to where it should be.